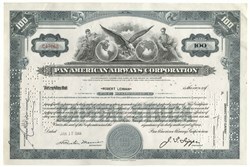 Pan American Airways Stock Certificate Issued to and Signed: Robert Lehman Robert Lehman was an American banker who headed Lehman Brothers and was a well-known racehorse owner. Lehman Brothers was a global financial services firm that was the fourth largest investment bank in the US before declaring bankruptcy in 2008. Lehman was known for his success with �betting on people.� Lehman would often invest in businesses or operations that were put together and headed by people he had faith in. One of those people was Juan Trippe and his Pan American Airlines. Lehman invested significant funds into Pan AM that helped get the company of the ground. 1844 Henry Lehman, an immigrant from Germany, opened a small food store in Montgomery. 1850 Henry join his brothers Emanuel and Mayer and they name their business Lehman Brothers. 1858 The brothers opened an office in New York. 1860 The brothers moved to New York and New York Cotton Exchange the foundations. 1887 Lehman Brothers becomes a member of the NYSE. 1888 Lehman arranged its first public offer for the International Steam Pump Company. 1929 The Lehman Corporation is created, a closed investment company. 1962 Together with Salomon Brothers, Merrill Lynch & Co. and Blyth, the corporation creates an association rivaling with the leading giants in intermediation. 1975 The corporation acquires Abraham & Co.
1984 American Express buys Lehman Brothers and merges the corporation with Shearson. 1993 American Express gives up Shearson, and the independent company becomes once again known as Lehman Brothers. 1994 Lehman is listed in New York and Richard Fuld is taking the lead. 1998 Fuld rejected rumors that the collapse of Long Term Capital Management caused a liquidity crisis. 2002 Lehman Brothers starts a wealth and asset management division. 2003 Lehman Brothers acquires Neuberger Berman and The Crossroads Group. 2007 The corporation has record levels of net revenues, net income and earnings per share. 2008 Lehman enters into bankruptcy, which is by far the largest in U.S. history. 2009 The company sues Barclays to recover billions of dollars in assets illegally transferred to the British bank. Robert Lehman (September 29, 1891 � August 9, 1969) was an American banker, head of Lehman Brothers for decades and a notable race-horse owner, and important art-collector and philanthropist. Born in New York City, he was the son of Philip Lehman (1861�1947), head of Lehman Brothers investment bank. He was a 1913 graduate of Yale University and member of Delta Kappa Epsilon fraternity (Phi chapter). When his father retired in 1925, "Bobbie" Lehman assumed the leadership role of the family-owned business. He took over the bank during a time when Lehman Brothers, like its competitors Goldman Sachs and Morgan Stanley, was essentially a one-office firm. While sound financial principles were essential, Robert Lehman was often quoted as saying that he "bet on people." One of those people he believed in was Juan Trippe who would build Pan American World Airways into an industry powerhouse. Robert Lehman understood that to maximize Lehman Brothers' growth he needed additional investor capital. While still maintaining voting control, he was the first to invite non-family members to become partners. He understood too that the right partners could expand the company's opportunities through interlocking directorships. As such, he sold an interest in Lehman Brothers to John D. Hertz who had sold his Yellow Cab and The Hertz Corporation for a fortune and who sat on the board of directors of General Motors. Under Robert Lehman, the bank concentrated on rapidly developing consumer industries with financing deals arranged in retailing, airlines, and the entertainment business notably with the Keith-Albee-Orpheum theatre group 1928 deal that sold the majority of its stock to Joseph P. Kennedy which led to the creation of RKO motion picture studios. And, when Lehman put together start-up financing for Paramount Pictures, John D. Hertz would be their connection on Paramount's board. A lover of horses and a polo enthusiast, Robert Lehman played on a polo team with Averell Harriman, Jock Whitney and Tommy Hitchcock, Jr.. He was also a thoroughbred racehorse owner and breeder who had five horses compete in the Kentucky Derby. His horses, most trained by Ralph G. Kercheval, won numerous important stakes races including "The Correction Handicap" and the Long Island Handicap at Aqueduct Racetrack, and the Bernard Baruch Handicap at Saratoga Race Course. For six decades he built upon an art collection begun by his father in 1911 and devoted a great deal of time and energy as Chairman of the Board of Trustees of the Metropolitan Museum of Art. The importance of his collection became such that in 1957, nearly three hundred works were used for a solo exhibit at the Louvre Museum's Mus�e de l'Orangerie in the Tuileries Gardens in Paris. At that time, his was the only private American collection to be given that honor. In 1968 he received an honorary Doctor of Humane Letters from Yale University for having "enhanced the civic life, the culture, and the artistic development of our civilization." After his death in 1969, the Robert Lehman Foundation donated close to 3,000 works of art to the Metropolitan Museum of Art. Housed in the Robert Lehman Wing, which opened to the public in 1975, the museum has called it "one of the most extraordinary private art collections ever assembled in the United States". To this day, his Foundation remains active, operating the Robert Lehman Art Lecture Fund and sponsoring exhibitions in museums, both around the U.S. and worldwide. Other philanthropic activities include support for PBS television programming. The Robert Lehman Art Center at Brooks School in North Andover, Massachusetts is named in his honor. He married Ruth Leavitt, daughter of William Homer Leavitt and Ruth Bryan and granddaughter of United States Secretary of State, William Jennings Bryan. Lehman Brothers Holdings Inc. was a global financial-services firm. The firm does business in investment banking, equity and fixed-income sales, research and trading, investment management, private equity, and private banking. It is a primary dealer in the U.S. Treasury securities market. Its primary subsidiaries include Lehman Brothers Inc., Neuberger Berman Inc., Aurora Loan Services, Inc., SIB Mortgage Corporation, Lehman Brothers Bank, FSB, Eagle Energy Partners, and the Crossroads Group. The firm's worldwide headquarters are in New York City, with regional headquarters in London and Tokyo, as well as offices located throughout the world. On September 15, 2008, the firm filed for Chapter 11 bankruptcy protection; the filing marks the largest bankruptcy in U.S. history. The following day, Barclays plc announced its agreement to purchase, subject to regulatory approval, Lehman's North American investment-banking and trading divisions along with its New York headquarters building. On September 20, 2008, a revised version of that agreement was approved by Judge James Peck. Despite rumors that it would be acquired again, Lehman performed quite well under CEO Richard S. Fuld, Jr.. In 2001, the firm acquired the private-client services, or "PCS", business of Cowen & Co.  and later, in 2003, aggressively re-entered the asset-management business, which it had exited in 1989. Beginning with $2 billion in assets under management, the firm acquired the Crossroads Group, the fixed-income division of Lincoln Capital Management and Neuberger Berman . These businesses, together with the PCS business and Lehman's private-equity business, comprised the Investment Management Division, which generated approximately $3.1 billion in net revenue and almost $800 million in pre-tax income in 2007. Prior to going bankrupt, the firm had in excess of $275 billion in assets under management. Altogether, since going public in 1994, the firm had increased net revenues over 600% from $2.73 billion to $19.2 billion and had increased employee headcount over 230% from 8,500 to almost 28,600. In 2003, the company was one of ten firms which simultaneously entered into a settlement with the U.S. Securities and Exchange Commission (SEC), the Office of the New York State Attorney General and various other securities regulators, regarding undue influence over each firm's research analysts by their investment-banking divisions. Specifically, regulators alleged that the firms had improperly associated analyst compensation with the firms' investment-banking revenues, and promised favorable, market-moving research coverage, in exchange for underwriting opportunities. The settlement, known as the �global settlement�, provided for total financial penalties of $1.4 billion, including $80 million against Lehman, and structural reforms, including a complete separation of investment banking departments from research departments, no analyst compensation, directly or indirectly, from investment-banking revenues, and the provision of free, independent, third-party, research to the firms' clients. On Tuesday, September 16, 2008, Barclays plc announced that they will acquire a "stripped clean" portion of Lehman for $1.75 billion. This portion includes the Lehman headquarters building in the Times Square area of New York City, two data centers and the bulk of Lehman's trading and debt security operations, which will become part of Barclays Capital, a division of Barclays plc. On September 20, this transaction was approved by U.S. Bankruptcy Judge James Peck, who stated that, "I have to approve this transaction because it is the only available transaction" with a final reduced price of $1.3 billion (�700 million) after re-evaluation of asset prices. On September 20, 2008, a revised version of the deal, a $1.35 billion (�700 million) plan for Barclays Plc to acquire the core business of Lehman (mainly its $960-million headquarters, a 38-story office building in Midtown Manhattan, with responsibility for 9,000 former employees), was approved. Manhattan court bankruptcy Judge James Peck, after a 7-hour hearing, ruled: "I have to approve this transaction because it is the only available transaction. Lehman Brothers became a victim, in effect the only true icon to fall in a tsunami that has befallen the credit markets. This is the most momentous bankruptcy hearing I've ever sat through. It can never be deemed precedent for future cases. It's hard for me to imagine a similar emergency."